Solid fiberglass hull, hand laminated, using DBM stitched biaxial fabrics in conjunction with vinylester and isophthalic resin in hull layup. Ashland Maxguard gelcoat applied on all exterior fiberglass surfaces. A matrix of longitudinal and transverse foam cored stringers using DBM stitched biaxial fabrics in the lower hull and hull sides provide maximum hull stiffness. Internal lead ballast glassed into a fixed modified fin keel (no keel bolts) with choice of drafts. Balanced full skeg mounted rudder, with internal stainless steel rudderpost and integral stainless steel reinforcement. Yanmar 80 HP marine common rail diesel engine. Excellent engine access on all sides. 12 Volt exhaust fan for engine room. Groco raw water strainer for engine intake. 1 1/2″ stainless steel prop shaft with three blade bronze propeller. Three aluminum fuel tanks with baffles. Edson pedestal steering system with single lever control and guard. Stainless steel “destroyer” type steering wheel. Full skeg hung rudder with bronze rudder shoe. Selden internal furling mast with integral storm trysail/spare mainsail track and twin cable conduits. 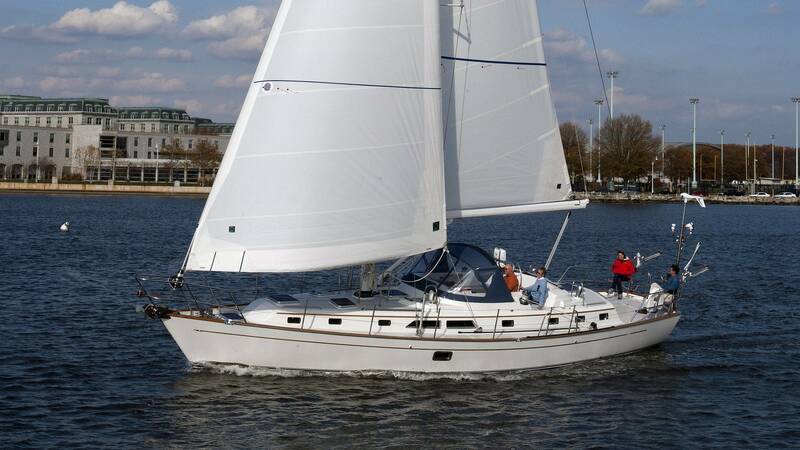 Four halyards: main, genoa, spinnaker and topping lift led internally. Steaming lights and foredeck lights. Furlex furling system for head stay. 2 – Two-speed #60 STC Genoa (Primary) winches. 1 – Two-speed #46 STC main sheet winch. 1 – Two-speed #46 STC utility winch. 2 – Two-speed #40 STC halyard winches. Six custom 316 stainless steel mooring fairleads. 316 stainless steel 1 ¼” bow and stern pulpits. 316 stainless steel 1 ¼”, 30″ high stanchions with custom bases. Double lifelines with 1.25” diameter stanchions. Four 316 stainless steel cowl vents with cover plates. 316 stainless steel teardrop cowl vent guards. Three stainless steel folding pad eyes. Offshore polished stainless steel overhead hatches. Offshore opening ports with safety glass and screens. Four custom 316 stainless tempered glass fixed windows. Harken aluminum genoa tracks with cars. Harken ball bearing traveler system with control lines and hardware. Fiberglass molded LPG storage compartment for two 20# tanks. Teak cockpit table with foldout leaves. Two molded coaming compartments with acrylic doors. Custom 316 stainless steel companionway sliding hatch with acrylic insert. Teak companionway doors with louvers. Custom 316 stainless steel boarding ladder on stern. Custom Blue Sea electrical panel (CE and ABYC compliant). A/C panel section includes two load groups and a source selector switch for two shore power lines and generator. D/C panel sections include two master breakers for two load groups. Five gauges for A/C and D/C panels. 110-volt shore power system, two 30 amp inlets and cords. Two 12-volt 8-D marine batteries. Two Group 31 engine start and windlass batteries. Balmar 120 Amp alternator with Maxcharge regulator. Victron 50 amp battery charger. Cabin lights customized to interior plan. Four 12 volt 6″ cabin fans. RayMarine i50 and i60 sailing instruments to include; depth, speed, and wind direction. RayMarine Type III Linear Hydraulic Autopilot with X30 core pack. Ritchie SP5″ pedestal mounted compass with cover. Cockpit mounted waterproof panel for navigation and exterior lights. Two 316L stainless steel water tanks with baffles. Eleven-gallon hot water heater (110 volt and engine driven). Constant pressure variable speed fresh water pump. Automatic sump pump in each head. Raritan electric toilet with built-in macerator in one head, and manual toilet in the other. Holding tank and piping for waste disposal in each head. Rule 2000 electric 12-volt bilge pump with automatic float switch. Rule 3700 electric 12-volt emergency bilge pump with automatic float switch. Rule emergency bilge pump in forward watertight area. Total electric bilge pump capacity 6,500 GPH. Custom 316 stainless steel double bow roller/stem head fitting. Delta 55 lb. Fast Set anchor with G43 HT all chain rode. Muir Storm 2200 electric windlass. Custom stern anchor hawse and cleat. Choice of American cherry or Burmese teak veneers and solid wood doors and lockers. Standard two staterooms, two head layout arrangement. Three stateroom layouts are available upon request. Custom interiors are available on request. All bulkheads are of marine grade plywood tabbed to hull sides and deck. Solid wood trim on all interior bulkheads and cabinetry. Wood ceilings on exposed hull sides. Solid wood handrails port and starboard. Removable overhead with wood battens. Numerous removable, locking floorboards with stainless steel hardware. Chrome and stainless steel hardware on all lockers, doors and cabinets. Corian counter tops in galley and heads with stainless steel sinks. Medicine cabinet in each head. Custom cushions covered in choice of fabric. 12 Volt Refrigeration and Freezer systems with keel coolers. Poured foam insulated refrigerator and freezer compartments with signature Passport front and top openings. Three-burner stainless steel LPG stove with oven. Safety LPG panel with solenoid. Custom deep double stainless steel sinks with Corian covers and wooden cutting boards. Complete Coast Guard equipment package including; PFD’s horseshoe buoy, flare kit, fire extinguishers and horn. Anchor and chain, dock lines and fenders. Two coats of bottom paint. The Standard Yacht Price is a sail away package. Your boat is completely commissioned with all specified equipment installed, launched and ready to sail in Annapolis, Maryland, or Fort Lauderdale.